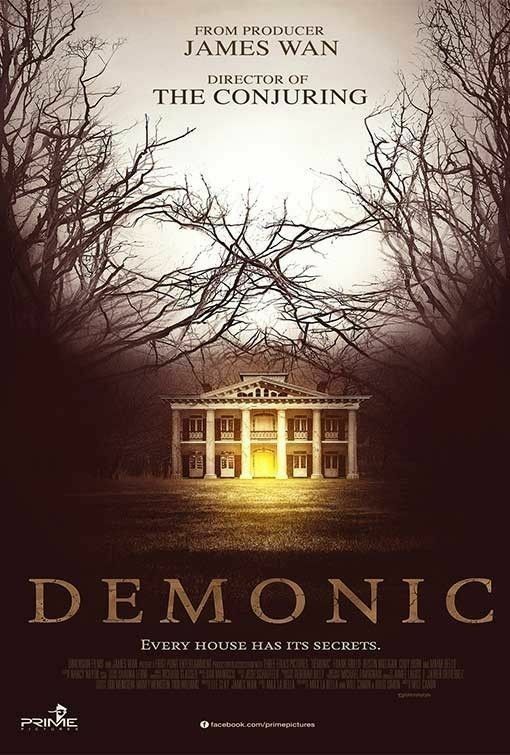 John’s Horror Corner: Demonic (2015), more paranormal investigators getting in over their heads, as usual. MY CALL: Good but not great, satisfying yet poorly-written, and made proficiently enough to be a jumpy-fun movie night. MORE MOVIES LIKE Demonic: It’s not at all fair to compare them, but Poltergeist (1982, 2015), Grave Encounters (2011), Paranormal Activity (2007) and Insidious (2011). Years ago this film initially hit the rumor mill hard and now, years after its premier release (in Asia, Europe and South America, 2015), it curiously has yet to find US distribution. Director Will Canon is a relative newcomer to the horror game with this obscure-by-distribution film—also released under the titles House of Horror, La Casa de Demonio, Demonsko, A Casa dos Mortos, House of the Dead and Haunted. What got me interested was that this was backed by James Wan (The Conjuring, Dead Silence). John (Dustin Milligan; Shark Night 3D, Slither, Final Destination 3) had been having visions of his dead mother; a haunting perhaps. He seeks the help of paranormal specialists and ghost hunters Sam (Alex Goode), Donnie (Aaron Yoo; Disturbia, Friday the 13th), Jules (Megan Park; Diary of the Dead), Michelle (Cody Horn; Magic Mike) and Bryan (Scott Mechlowicz; EuroTrip). To quell these visions, they return to the haunted house to set up cameras, conduct an evocation (a séance), and try to prove the presence of spirits. The plot is already a bit shaky here. It is suggested that his haunting will persist unless he returns to the house, but there isn’t even a hint of explanation as to why. Upon arrival to the house the “camera set-up routine” serves as an ice breaker in these ghost hunter and haunted house movies. This is where the film finds its personality. We’ve seen similar scenarios in Poltergeist (1982, 2015), Grave Encounters (2011), Paranormal Activity (2007) and Insidious (2011). We get the lay of the land, find some creepy clues, get to know our protagonists’ quirks, and maybe even some supernatural things happen right under our investigators’ noses as they position their hardware in the homes of feisty poltergeists. This film features some found footage (maybe 25% of the movie), but it is definitely not a “found footage” horror. It’s not particularly awesome (yet no explanation as to why this 2015 film still hasn’t had a US release in 2017), but I certainly find it entertaining. I’d even watch it again. The atmosphere is more than creepy enough (though it pales compared to Paranormal Activity, Insidious, The Conjuring, Dead Silence, Poltergeist, etc. ), there’s a couple of jump scares, and couple of legit scares. While most of what we see are brief spectral figures and doors opening and shutting on their own, they seem to be executed proficiently enough to elude actively feeling “old hat.” In fact, no lie, these jump scares were REALLY FUN! There’s little to be said for clever or innovative or original content. Just good, plain, consistently capable execution for maximum jumpiness. Its greatest shortcoming is that the story is very thin. The end gets more than a bit wonky, but it’s nothing I can’t forgive for the fun ride. This honestly deserves a wide release. It may get panned by critics, but it’s a fun date night, it would make money (the budget was only $3 million), and no one would leave feeling cheated.